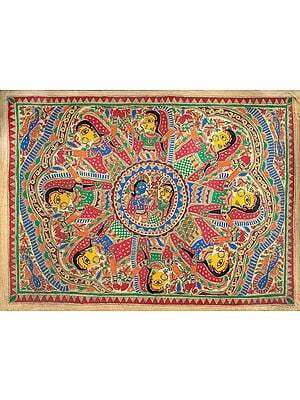 The charm of Madhubani paintings is multifold. Perfected by the women of the Mithila region of Bihar, this folk art form came about as a means to beautify the mud dwellings of the region. While these paintings have evolved to more mobile media such as fabric, canvas, and handmade paper such as the one you see here, the themes and technicalities of workmanship remain traditional. The dyes used are naturally derived vegetable-based pigments, often used in addition to lampblack and ochre. The lines and shapes employed, minimalistic. The themes are of a devotional nature, with the finished paintings giving away the spiritual inclinations of the artist who made it. This is a painting of the best-loved of Hindu deities, Krishna Himself. He is playing the characteristic flute, to the music of which dances His precious Radha. The depiction of Radha-Krishna in this painting is most unusual. 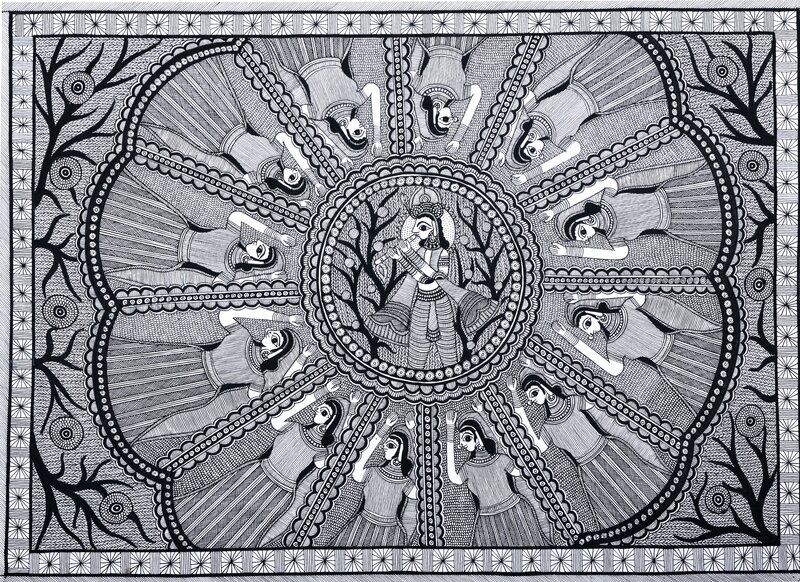 While Radha is seen to dance to Her Krishna's music in many compositions, this one has the Krishna figure at the pistil. A figure of Radha is painted on each of the petals that surround it. Her arms are raised, Her ghagra flowing to the motions of the dance. Her jet black hair cascades down Her back. Despite the minimalistic strokes of the brush that are atypical of Madhubani paintings, the 12 figures in this painting are each replete with befitting shringar. Krishna's flowing silks and elaborate crown have been painted with painstaking detail, the trees behind Him the very picture of the Vrindavan of His boyhood.